Cyber Chicken is probably one of the silliest action platformers I've heard about for a while and it arrives on Steam for Linux on November 21st. It doesn't seem to have an official site, but it does have an IndieDB page. I'm really not sure what to make of it, the movement and combat looks like you float around in low gravity. I've been offered a Steam key for review, so I'm waiting to hear back. I hope it's better than the movement style looks. It could end up actually being quite fun, so I will wait and see for myself. Published by Groupees Interactive and developed by indie studio WHOA!, Cyber Chicken is a 2.5D side-scrolling action adventure platformer set in a dystopian New York City of the future. 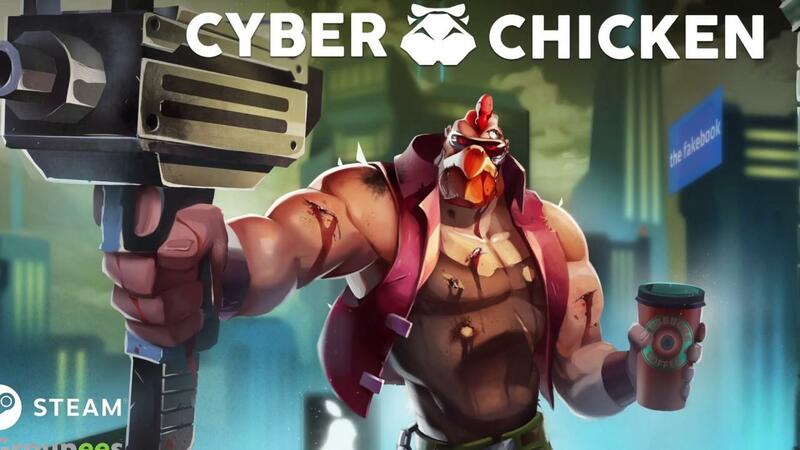 Play as the ferocious Cyber Chicken, a military-grade cyber-organism facing a cyberpunk revolt in this balls-to-the-wall homage to ‘80s action heroes. The Fakebook, Big Bucks Coffee, and intergalactic leader GW have played you for a fool. They had you wasting your time chasing after scrawny cyberpunks instead of the real villains. It’s time to take these corporate giants down ... one bullet at a time. Equip a Magnum 357,000, Napalm Flamethrower, Sawed-Off Howitzer, Thermonuclear Dual Uzis, and more to deal some real damage to the enemy. You can also upgrade your weapons and platforming abilities at Big Bucks vending machines -- but avoid going into debt: If you owe money (and fail to pay on time), the nastiest corporate accountant known to man (“The Collector”) will track you, kill you -- then steal all of your hard earned upgrades! * Terminate enemies with Cyber Chicken’s multi-weapon arsenal and skill set with over 45 upgrades. * Double-jump, dash, ground-stomp and wall-jump your way through more than 13 levels in a semi-open world -- upgrading to unlock new areas. * Enjoy a fully voice acted cast and soundtrack featuring 40 original tracks. * Comic book-style, story-driven gameplay with lots of comedic moments to balance the mayhem. * Custom keybindings with support for mouse and keyboard or controller. The chicken part aside, it seems quite boring actually. "Dump Towers: Only the Choicest Bankrupt Property Around"
Last side scrolling murder-chicken game I played was Rocketbirds. That one had a great soundtrack! He, chicken… Gender confused rooster? What?